Color, 1961, 100 mins. 47 secs. B&W, 1963, 104 mins. 54 secs. 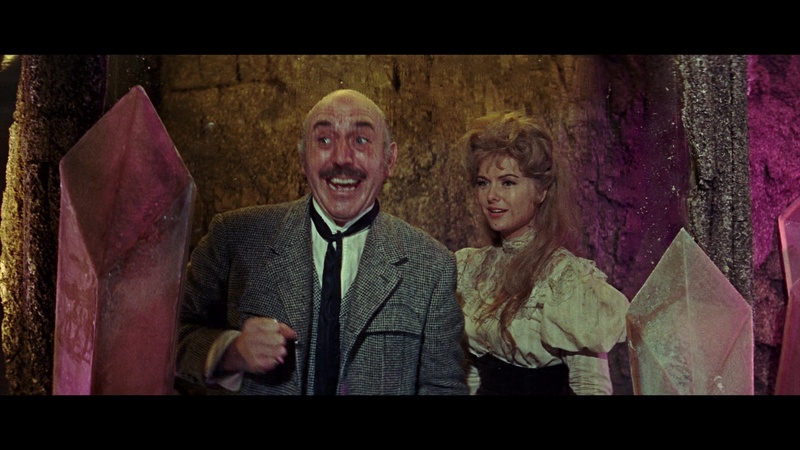 Color, 1964, 103 mins. 2 secs. This third and final boxed set devoted to the work of Ray Harryhausen, a visual effects maestro who truly earns the term "visionary," from UK label Indicator comes on the heels of the three-film sets devoted to his Sinbad series and a trio of sci-fi and fantasy favorites. 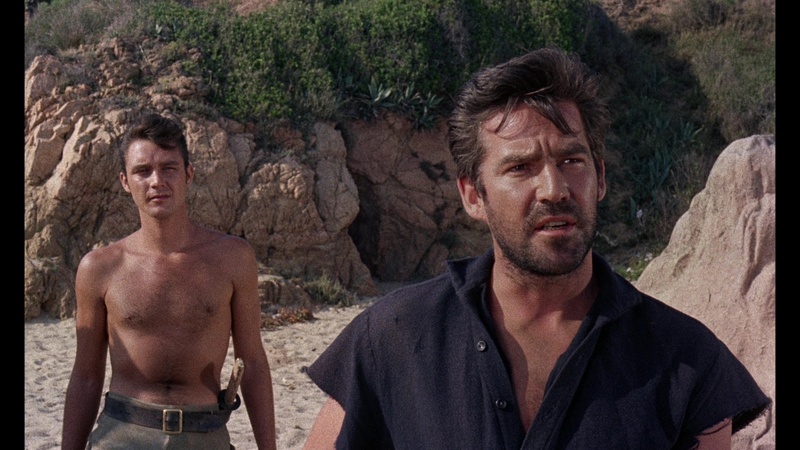 This time, the dual-format set focuses on his last three 1960s films at Columbia Pictures, which had essentially been his Hollywood home base since 1955; after 1964, he would make two more films that decade, One Million Years B.C. 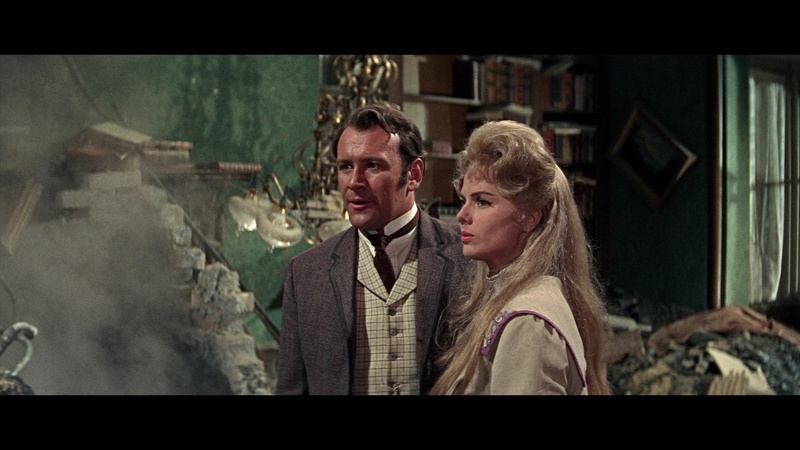 and The Valley of Gwangi, for other studios, titles currently available on Blu-ray elsewhere. 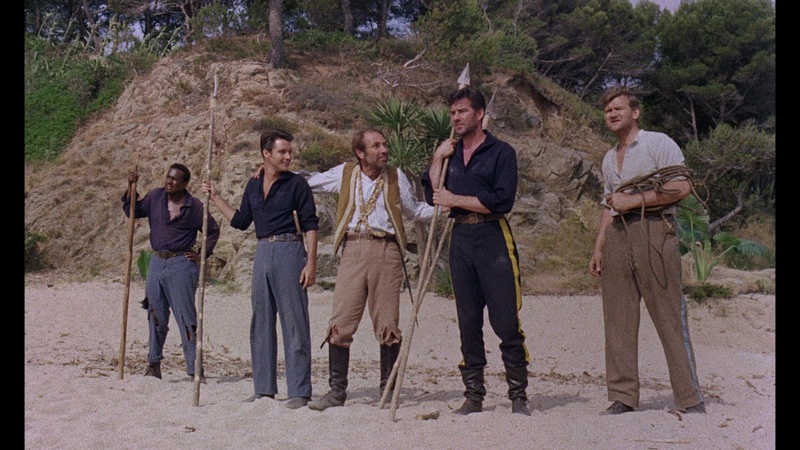 Following the odd but charming The 3 Worlds of Gulliver, Harryhausen returned with another adaptation of European literature: Mysterious Island, based on legendary French writer Jules Verne's 1874 semi-sequel to 20,000 Leagues under the Sea. Director Cy Endfield, who would excel in rugged adventures later on with Zulu and Sands of the Kalahari, brings a lively spirit to the creature-filled yarn about a quartet of Civil War soldiers -- Cyrus (Craig), Gideon (Merrill), Herbert (Callan), and Neb (Jackson) -- who escape via hot air balloon from a Confederate jail, with the forced aid of one of the guards, Pencroft (Herbert). Once airborne, they end up on a remote, uncharted island in the Pacific filled with strange topography and oversized beasts including a gargantuan crab. After joining forces with a pair of shipwrecked English women, Lady Mary (Greenwood) and niece Elena (Rogan), they encounter more threats including giant bees before realizing that they're in the domain of the infamous Captain Nemo (Lom), whose prior adventures aboard the Nautilus have become legendary. 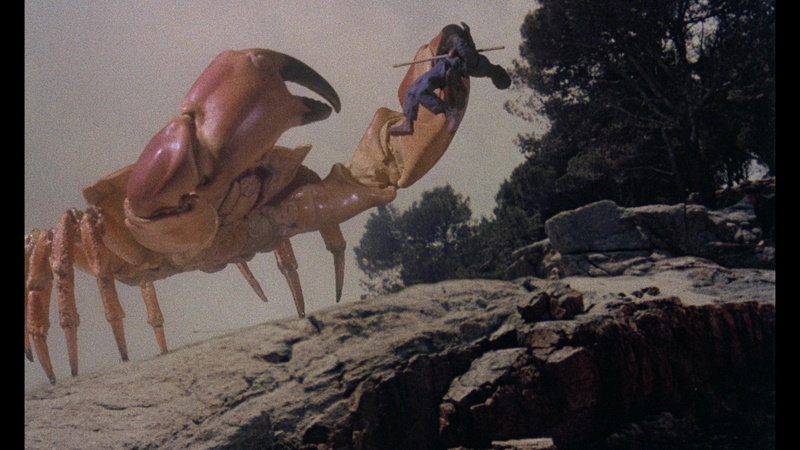 A very popular item both in theatrical reissues and on home video, Mysterious Island remains one of the more beloved and frequently reissued Harryhausen titles. 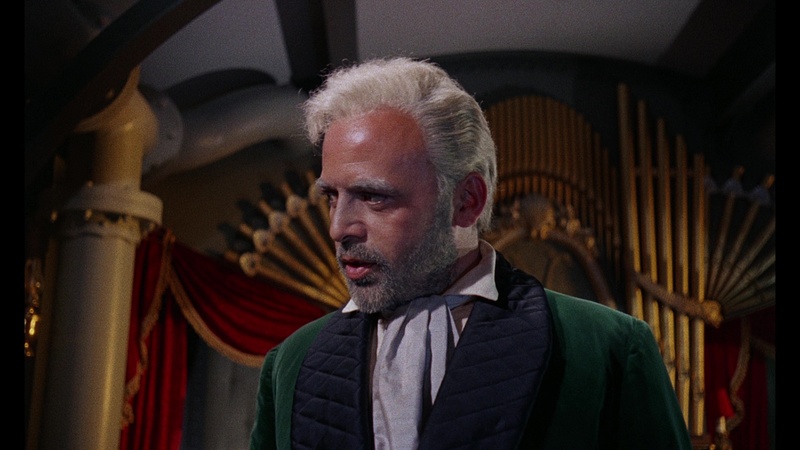 The film manages to retain the essential optimism of the Verne novel (with Nemo's quest to create world peace painted in a more benign light here than in his previous exploits), and casting the always enjoyable Lom is a nice touch that makes the wait for his appearance worth it. 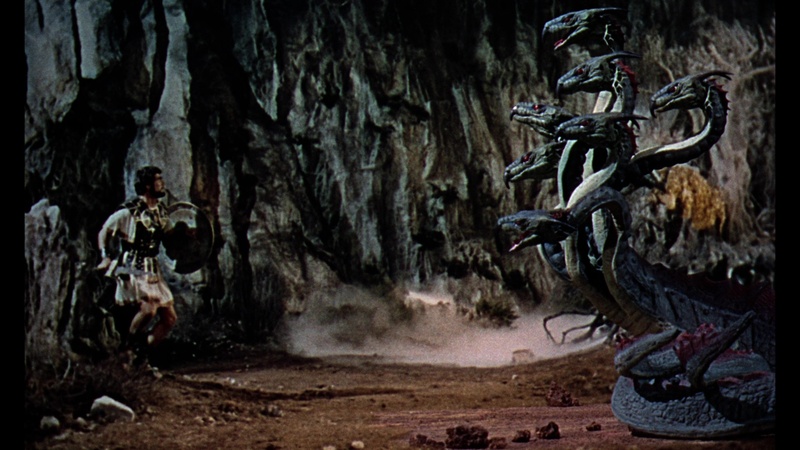 None of the male leads get to exhibit much of a personality but exhibit plenty of action chops opposite Harryhausen's menagerie of stop-motion creatures, and the great Bernard Herrmann provides the third of his three great Harryhausen scores with plenty of orchestral bombast to keep the blood pumping. It's also a joy to see Greenwood (who has one of the greatest speaking voices in movie history) in just about anything, and as usual she manages to make even the most mundane dialogue sound delicious. Following its runs on VHS and laserdisc, Mysterious Island bowed on DVD from Sony (or Columbia/Tristar in its initial run) in 2002 with a slightly overmatted 1.78:1 transfer and extras including the trailer (and two bonus Sinbad ones), the usual "This Is Dynamation" featurette from many other Harryhausen releases, a general 9-minute featurette, and a poster and stills gallery. Twilight Time brought the film to Blu-ray twice, first in 2011 (featuring only the trailer, a TV spot, and isolated score track) and again in 2014 with a Harryhausen interview (11m14s), the vintage featurette "Islands of Mystery" (5m31s) about exotic, fantastic island locales tied to the film, the isolated score track, a trio of TV spots, three trailers, and best of all, an audio commentary with Randall William Cook, C. Courtney Joyner and Steven C. Smith that's packed with Harryhausen trivia and notes about the state of Columbia Pictures at the time. Liner notes by Julie Kirgo are also included. Even more robust is the Indicator release, which ports over the prior three-man commentary and adds a fine new one with Tony Dalton as well. It also contains the "Islands of Mystery" featurette, trailers, and TV spots, while a greatly expanded new gallery has been included with tons of promotional material and production photos. The isolated track is present again, with the original mono (LPCM) or remixed 5.1 (DTS-HD MA) audio options provided, with optional English SDH subtitles, plus an optional 50s Harryhausen intro to the film. Not enough? How about interviews with Harryhausen (9m5s), Michael Craig (3m18s), and camera assistant Ray Andrew (2m43s) plus new chats with special effects artist Hal Hickel (10m17s), called "Mysterious Magic," and horror/fantasy expert Kim Newman (21m12s)? Also included is a Super 8 condensed version (19m12s) in color and featuring narration to spackle over the missing bits. Finally, "Back to Mysterious Island" presents a 2008 comic book series based on the novel. The transfer is the same recent, excellent restoration used for the Twilight Time reissue, and there's really nothing to fault here; the Indicator gives it the roomiest bit rate of them all and looks sterling in motion from beginning to end. 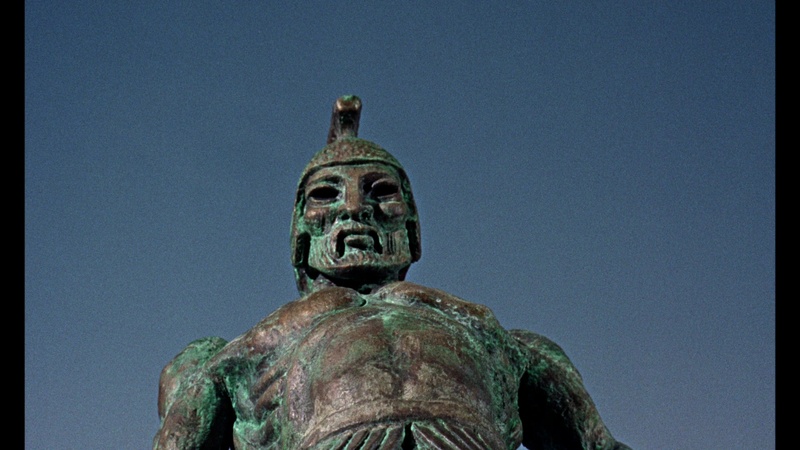 In the running as the most popular Harryhausen film of them all, Jason and the Argonauts can also lay claim as perhaps the greatest Greek mythology fantasy film. Barely saved by the gods as a baby during a massacre led by Pelias (Wilmer) to seize the throne of Thessaly, Jason (Armstrong) meets his nemesis again as an adult. 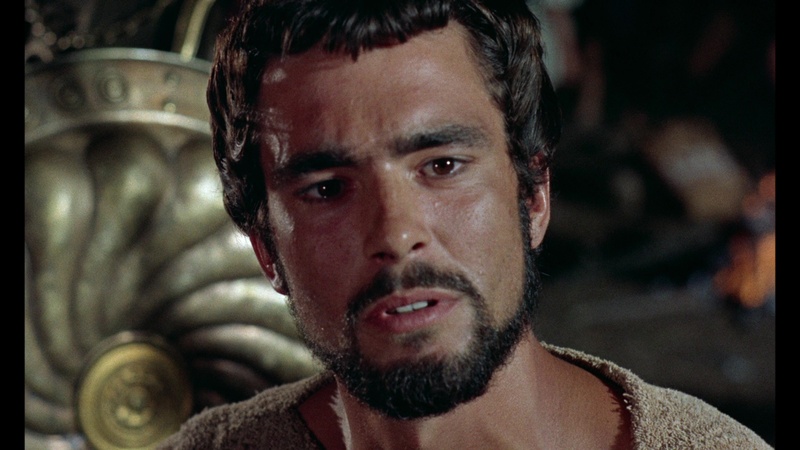 Paranoid due to a prophecy that warns of a one-sandaled man (which Jason is), Pelias goads Jason into a dangerous voyage aboard the Argo find and retrieve the valuable and supernatural Golden Fleece across the ocean. 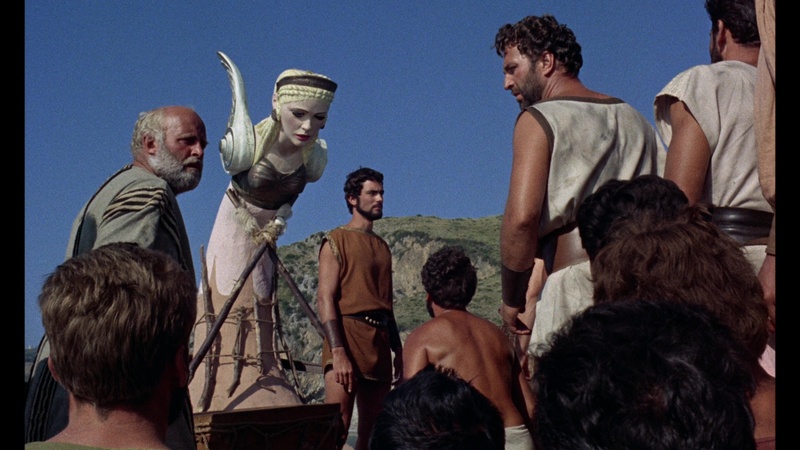 The gods, led by Zeus (Curse of the Demon's MacGinnis) and Hera (Goldfinger's Blackman), intervene on Jason's behalf with a visit to Mount Olympus, where he's told that an animated ship's mast in Hera's image will offer him aid five times. Complete with a crew including the super-strong Hercules (Green), Jason embarks on his mission that will bring perilous confrontations with the giant metallic Talos, a band of nasty harpies, the multi-headed hydra, and ultimately, a band of sword-swinging skeletons. 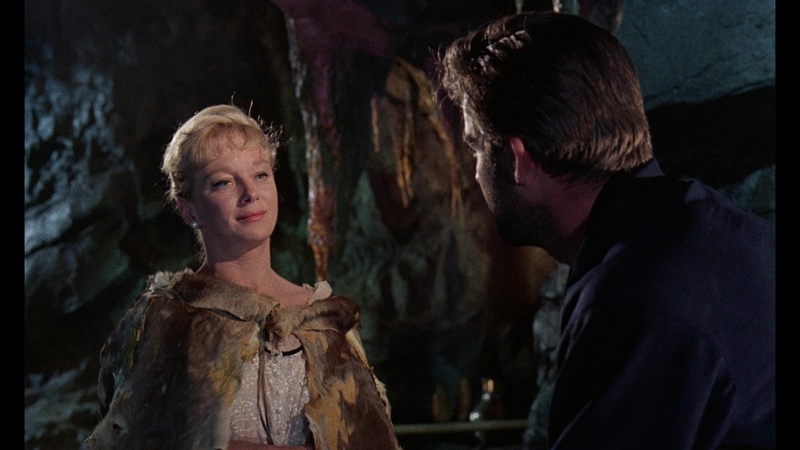 Playing fast and loose with the original mythology (though not as drastically as Harryhausen's later Clash of the Titans), Jason is a model of narrative economy and savvy casting with great batch of British character actors on hand. (Poor lone American Armstrong had to be dubbed to fit in!) Herrmann is on hand again for the last time with Harryhausen to provide a stirring, brassy score, one of his very best from the decade, and Harryhausen is at the top of his game here with a wide variety of creatures and action scenes including that eye-popping skeleton finale, which manages to advance the already classic one from 7th Voyage of Sinbad to new technical heights. 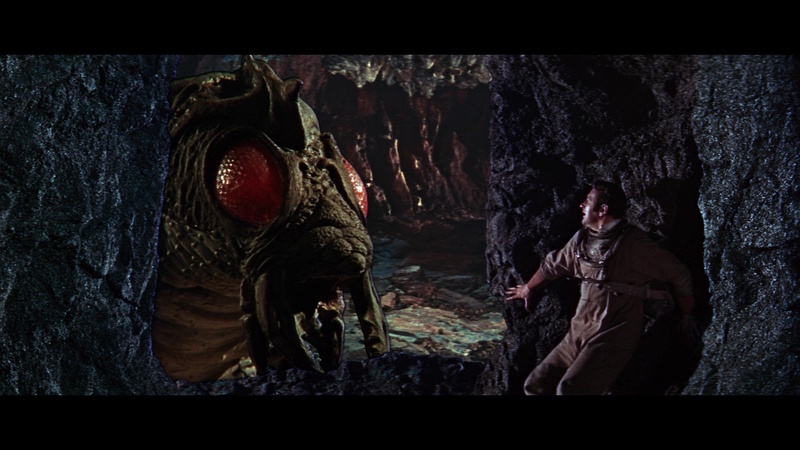 As with the first Sinbad film, the aspect ratio of this film has been the subject of some confusion with early video releases bouncing between 1.33:1 (the VHS and Criterion laserdisc) and 1.75:1 (Sony's 1998 DVD); Harryhausen's preference to frame for either framing choice didn't really help matters much either. The best option, 1.66:1, reveals the most significant amount of image info and was selected for the film's bow on Blu-ray in 2010. That release was one of Sony's strongest catalog releases at the time, looking remarkably fresh and detailed for a film that was often seen in theatrical revivals appearing more ragged and faded each time. Audio options on that one include a DTS-HD MA 5.1 mix (terrific) with optional English SDH subtitles as well as two fine commentaries, the first with Harryhausen and film historian Tim Dalton and the second with Cook and Peter Jackson. Also included were the John Landis 11m53s interview with Harryhausen (also found in the first Indicator box), "The Harryhausen Legacy" (25m31s) featurette, the vintage "The Harryhausen Chronicles" (57m58s) centered around a lengthy interview with the great man himself, and skeleton fight storyboards. (There's also a BD-Live function, if you remember that short-lived gimmick.) The Indicator disc is exactly the same, right down to the menu screen and compression settings; though Super 8 versions were indicated in packaging materials, they are not included. After dabbling in the world of Jules Verne, it was inevitable that Harryhausen and company would eventually take a stab at H.G. Wells. 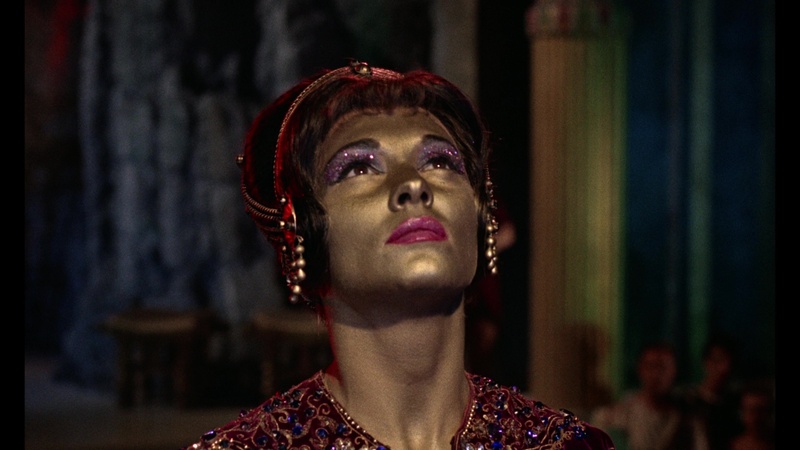 That day arrived with the last '60s Columbia film in the Harryhausen cycle, First Men in the Moon, which finally returned to sci-fi territory as well. It's also notable as the one time Harryhausen acquiesced to making a film in scope, a widescreen process he hated when it came to stop-motion effects, though the end result still became a favorite of impressionable young viewers at countless matinée screenings. Featuring a script by none other than Quatermass creator Nigel Kneale, this would be the third and last of Harryhausen's films with director Nathan Juran, who had done duties on 7th Voyage of Sinbad and 20 Million Miles to Earth. When a modern-day United Nations lunar mission discovers a decades-old Union Jack on the moon's surface, the explorers follow clues to the elderly Arnold Bedford (Judd), who claimed to have made the outer space voyage at the turn of the century with his fiancée, Kate (Hyer). Via flashback we see how they accomplished this unlikely feat through the ingenuity of colorful inventor Joseph Cavor (Jeffries), who has constructed a workable spaceship. 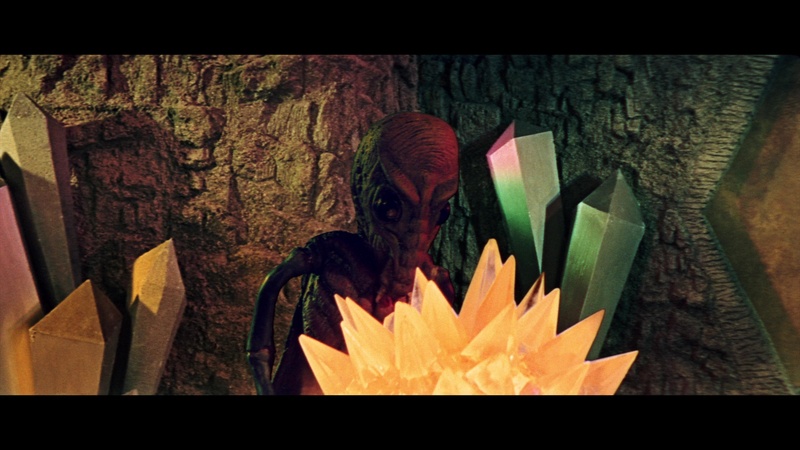 Their rocky arrival on the moon soon puts them in contact with a kingdom populated by the creepy, insect-like Selenites, as well as a giant caterpillar-style creature. Soon it becomes clear that not all of them may return to Earth as they scramble to negotiate with and evade the moon's inhabitants. 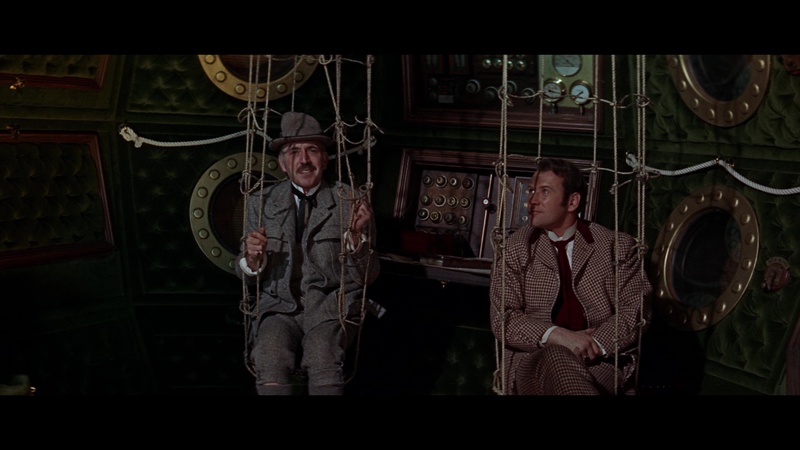 Perhaps due to its lower quotient of monster action and period sci-fi trappings, this isn't the first film one usually thinks of when Harryhausen's name comes up; it feels more like the barrage of British explorer adventures based on Wells and Verne that poured into theaters around this time like Master of the World or Five Weeks in a Balloon. 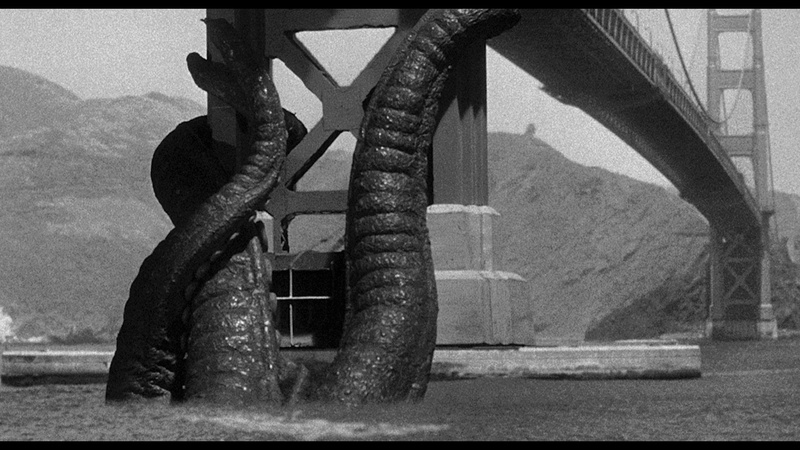 However, the creature effects are quite impressive when they arrive, and the heavier British emphasis than usual gives it a nice change of tone when you're tearing through all of the films in this set. The widescreen framing and dense, elaborate soundtrack (which was often shown in stereo or even six-track for large format engagements) give it a rich, impressive feeling. The end result is a minor but engaging film that often feels like a vintage miniature, sweet and charming in its innocence with enough bright, splashy colors and crazy effects to keep our eyes more than occupied. Late to the game in the Harryhausen catalog on both DVD (in 2002) and Blu-ray from Twilight Time (in 2015), this film has always looked quite solid on home video and really shines courtesy of the restored 4K transfer prepped by Sony for its HD releases. 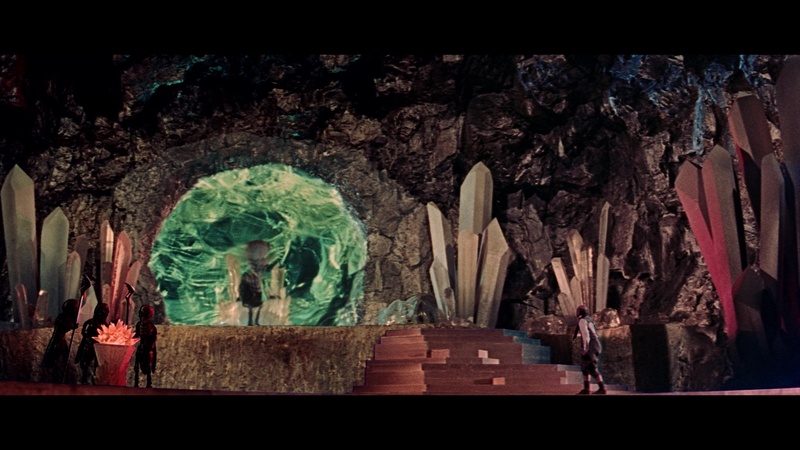 The colors here really border on psychedelic at times, especially in the second half, and the spaceship interiors and the Selenite caverns have a nice sense of depth and texture that makes this a fun demo piece for classic sci-fi fans. Even more impressive is the sound mix, with LPCM stereo or DTS-HD MA 4.0 or 5.1 options that really show off the booming, evocative score by regular The Avengers composer Laurie Johnson (also present as an isolated score track). Ported over on the Indicator release from the Twilight Time are another top-notch Harryhausen and Cook commentary (expect plenty of detail about the hurdles of getting his critters to work in 2.35:1), a Cook intro (4m54s), a trailer and teaser, and a vintage "Tomorrow the Moon" making-of featurette (4m33s). On the new extras front you can expect new interviews with effects assistant Terry Schubert (4m40s), titles designer Sam Suliman (3m38s), and production manager Ted Wallis (16m23s), a Trailers from Hell trailer option with John Landis, and another severely fleshed-out gallery loaded with making-of photos, stills and promo material. The new interviews are quite good and full of trivia about the conditions of making this in the UK, with Wallis in particular full of tales about wrangling set materials and creating the alien environments. As with the past two boxes, the packaging is sturdy and dense with an 80-page book containing Kim Newman and Tim Lucas as well as vintage interview snippets compiled into illuminating oral histories of all three films. Reviewed on December 4, 2017.